Extremely Wicked, Shockingly Evil and Vile aims to put a new spin on one of the most famous serial killers of all time but loses focus in the latter half. Summary: 1969. Ted (Zac Efron) is crazy-handsome, smart, charismatic, affectionate. And cautious single mother Liz Kloepfer (Lily Collins) ultimately cannot resist his charms. For her, Ted is a match made in heaven, and she soon falls head over heels in love with the dashing young man. A picture of domestic bliss, the happy couple seems to have it all figured out … until, out of nowhere, their perfect life is shattered. Ted is arrested and charged with a series of increasingly grisly murders. Concern soon turns to paranoia—and, as evidence piles up, Liz is forced to consider that the man with whom she shares her life could actually be a psychopath. There is a very strange moment in Extremely Wicked, Shockingly Evil and Vile, toward the latter half, when you realize that if this wasn’t based on a true story and you didn’t know how this ended you might think that Ted Bundy was innocent. It’s an extremely odd feeling and the moment when you realize that something has gone wrong over the course of this story. Extremely Wicked, Shockingly Evil and Vile starts off with an interesting point of view; instead of following Bundy we see the story through the eyes of Liz Kendall (Lily Collins). 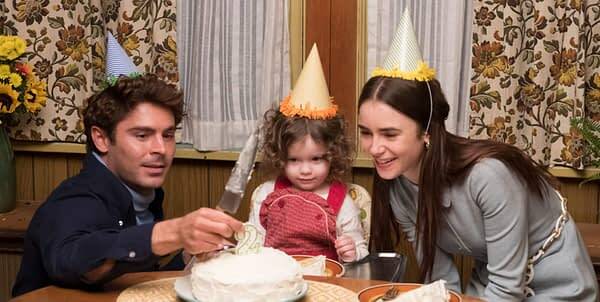 Zac Efron, Macie Carmosino and Lily Collins in Extremely Wicked, Shockingly Evil and Vile. Courtesy of Sundance Institute | photo by Brian Douglas. Liz’s story is interesting and one that absolutely should be explored. The movie taking on the point of view that Bundy is innocent makes sense when our point of view character thinks he is innocent. The first half of the movie is the most interesting part because of that. Star Zac Efron puts on a truly charming performance with these little hints at the monster below the surface. We know to look for them, but he has everyone else fooled. Liz doesn’t stick around though and eventually, she doesn’t see Bundy in person anymore. The court case in Florida is the point when the movie starts to lose focus. It wants to show off its recreation of that infamous court case but it still uses the point of view that Bundy might be innocent. This perspective doesn’t make much sense when Liz is no longer our point of view, and the movie starts to fall apart. The ending is saved by the fact that the cast does a great job. Jim Parsons as Florida Prosecutor Larry Simpson who is so exasperated by Bundy’s attempts to play the system and John Malkovich as Judge Edward D. Cowart looks like he’s in danger of rolling his eyes so hard they’ll roll straight out of his skull at times. Extremely Wicked, Shockingly Evil and Vile starts off strong but falls apart in the latter half. The film, like the public, gets taken in by the raw charisma of Bundy himself. He’s not the most interesting part of this story though–Liz is. When the movie forgets that, it just can’t stick the landing.